Crumbly texture with a tangy flavour. Lancashire is one of the few traditional cheeses made in Britain, with its making stretching back hundreds of years. When times were hard and meat a rarity, the poor folk of Lancashire made a filling meal of just cheese. Infact this cheese became the staple food of the mill-workers who were crammed into the miserable back-to-back houses with little or no cooking facilities. 'Many's the night I've dreamed of cheese - toasted mostly,' sighs Ben Gunn in Robert Louis Stevenson's treasure Island. He probably meant Lancashire, the famous 'Leigh Toaster'. In 1939 there were 202 farms turning out 1260 tons of Lancashire every year. However, the cheese became a casualty of the war effort with all milk being used for mass cheese production as instructed by the Ministry for Food. In 1948, with the limited post war revival, only 22 farms returned to Lancashire cheese-making. By 1970 there were only 7, and today there are only three making the real unpasteurised Lancashire, all in the Preston area. Making Lancashire in the traditional way is a laborious process. The curd made on one day is added to the previous day's curd, which has already been drained, salted and partly pressed. Both curds are then milled, placed in moulds, pressed for 24 hours, bandaged, waxed or buttered, and ripened for at least two months. The laborious methods needed to achieve this fragile cheese do not lend themselves to factory practices. New Lancashire, Fatty Lancashire and Single-Acid Lancashire are all names given to Lancashire made on a factory scale - all are made using a single days curd and are far inferior, and an insult, to real Lancashire. Today, Lancashire is a highly underrated cheese because most people only know these imitations. The original reason for the combining of curds from different days is believed to have been due to the poor roads in the area which made travelling slow and difficult. Therefore, the curds were gathered each day and transported to the cheese house every few days. 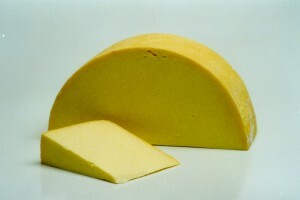 Lancashire is the softest of the English pressed cheeses, with a loose and crumbly texture. It is matured for two to three months but can be matured for up to six months by which time the texture becomes creamy and almost spreadable. Lancashire is undoubtedly the king of toasting cheeses - the 'Leigh Toaster'. When melted it has a soft silky, custard-like texture, and the aroma is unforgettable. Our Lancashire is made by Ruth Kirkham and is made using unpasteurised cows' milk from Fresian cows. Each truckle is approximately 20cm in diameter, 30cm high, weighs 12kg and has a fat content of 48%. Larger truckles are also made weighing upto 25kg.